There’s a perfect way to make just about any food, and I’ve read whole articles about omelets to prove it. I’m not that kind of cook. And I don’t even aspire to be. Working moms of 4 can’t also be gourmet chefs. Besides, I’ve got a lot of running, biking and playing that I would rather be doing. Instead, my goal is to make healthy, easy meals that taste delicious. And yes, food can be delicious without being gourmet. This tofu recipe isn’t perfect. If I had a deep fryer, and I was willing to use a vat of oil, it might be better. But this recipe is really easy, and it tastes fabulous. Plus, it’s foolproof. Make it once, and you won’t have trouble thinking of ways to use it. You’ll probably eat most of it right off the tray. Just in case, though, try putting tofu in stir fry, eggs, Asian noodle salad or over steamed or sauteed veggies, like string beans or broccoli. Preheat oven to 450 degrees. 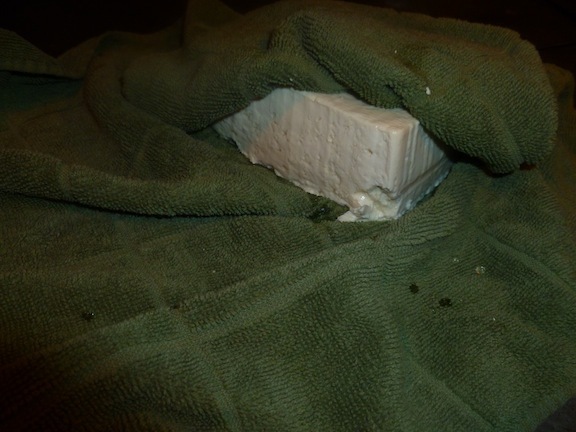 Drain the water from the tofu package and press it between a towel. Dice the tofu to desired size. 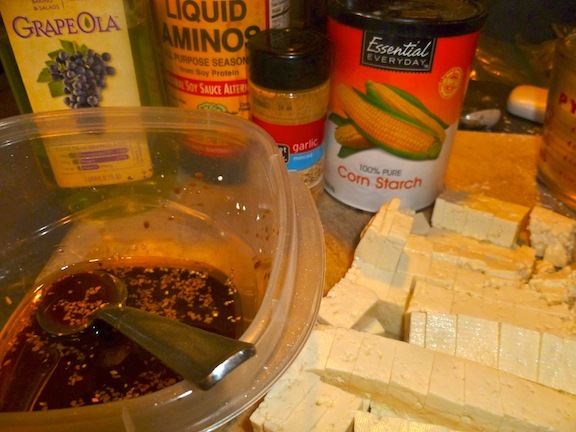 Combine the remaining ingredients in a bowl and then add the tofu. 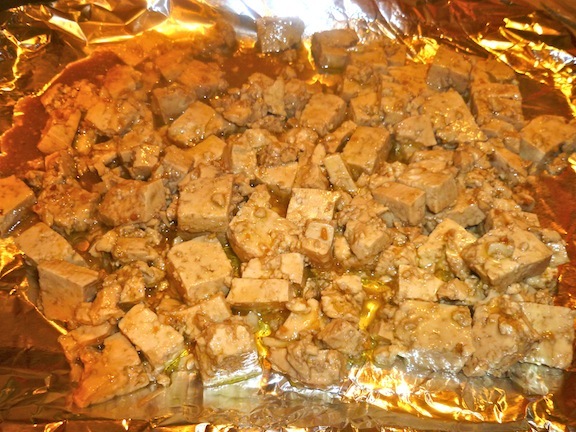 Stir until tofu is coated and let it marinate for at least 10 minutes. The longer it marinates, the more it will absorb the taste. 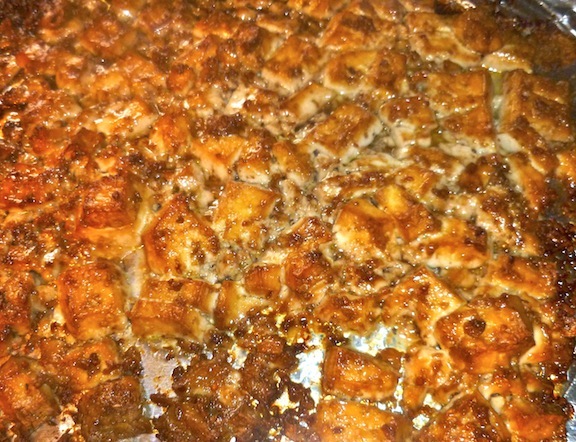 Spread the tofu over a coated pan and bake for about 30 minutes, turning once in the middle. If you like your tofu crispier, let it bake another 5-10 minutes. *Braggs Liquid Aminos is similar to Tamari sauce but with a slightly different taste. I use the two interchangeably. What I like about Braggs, is that the sodium content is significantly lower (6% compared to 30%), and it costs less. 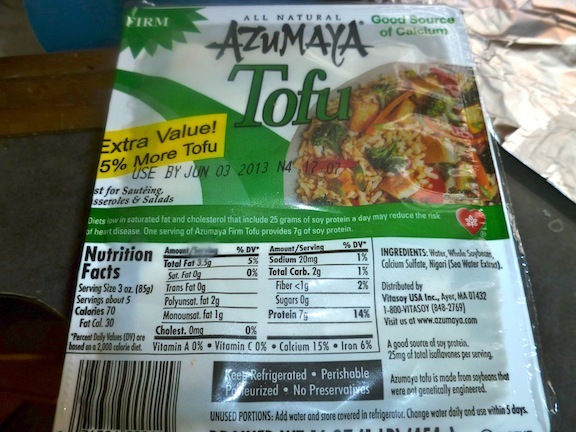 The ingredients are simpler too, containing only vegetable proteins from soybeans and water. You can find it at Whole Foods, and I’ve even seen it at the produce store.